When our Seeds of Strength members and guests convened at Ride on Center for Kids (ROCK) on a cold Friday morning, we were met by a smiling Karah Ricketts, the Community Development Manager. After we all signed in, Karah led us to the Rockateer Room (the volunteers are called Rockateers). That day the room was filled with Rockateer students, GISD high schoolers, who were waiting for the bus bringing new clients — special-needs students from GISD elementary and middle schools. Kids on that bus were coming for their first morning of a seven-week program at ROCK. Ride on Center for Kids began with a crazy idea by founder, Nancy Krenek, who thought that a horse could help kids who needed physical therapy. When ROCK began in 1998, it began with one horse, four children, and not much else. Today it has expanded to 28 horses, sixty acres of land, a covered arena, over 300 clients, and 350 Rockateers. ROCK serves a diverse population of children, seniors, and veterans. It serves special-needs children and adults with various combinations of physical therapy, equine therapy, and support. 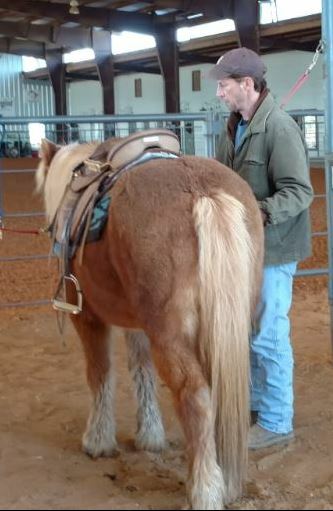 Other programs include equine therapy for veterans, a women-only program for veterans who have experienced sexual assault while in the military, a camp for the children and families of veterans, camps for the siblings of special-needs children, as well as partnerships with several universities which study the benefits of equine therapy for various populations. The $25,000 grant given by Seeds of Strength in 2017 is to underwrite the Therapy for Under-Served Children with Disabilities Program. Over $50,000 in financial assistance is provided annually for this program, and the SOS grant is a huge part of that assistance. This grant will help ensure that all children with disabilities who could benefit from the ROCK program become clients. It was too cold to ride on the day of our visit, but as we walked through the classroom where the Rockateers were working with the special-needs group, there was an air of excitement. One student was holding the hand of her special- needs counterpart and, on a model of a horse, was helping her identify the parts of the horse. Two other students were using flash cards to identify the horse anatomy and then touching the miniature pony in the right spot. There was laughter and friendship in the room. It was clear that all the students, both volunteers and clients, were gaining from the experience. The motto of ROCK is, “If you can lead a horse, you can lead your life.” That motto is being carried out in profound and miraculous ways at Ride on Center for Kids. Our SoS grant makes it possible that no child who can benefit from this therapy is ever turned away.